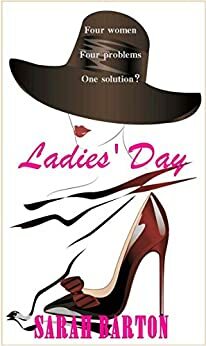 I’m joined by Sarah Barton today, author of Ladies’ Day, who is sharing a bit about the characters in the book and what’s next writing-wise for herself. There are four main protagonists – Amanda, Hayley, Marianne and Jane. Amanda: In my line of work I deal with domestic violence. The desperate situation that victims experience and the courage they show to try to escape inspired me to write her character. Hayley: I have myself experienced problems conceiving a child and understand the emotional trauma that infertility causes. Often this is hidden away and that is what inspired me to create Hayley. Marianne: There have been times and no doubt there will be more, when I have over spent on credit or store cards. Splashing out on luxuries – it is easy to see how debts creep up without realising how dangerous the situation can become. Jane: Her lifeline is her bond with her parents. Despite the weakness of her infatuation, she seeks and finds the strength she needs from her mother and father. I too have been fortunate enough to have parents who love unconditionally. The Creation of your Characters – do they have similarities with someone ‘real’? Each character was created taking mannerisms and foibles from those around me. I suppose there is a part of me in each character. Amanda – There is always a running dialogue going on inside my head whether that be with myself or an imaginary person. Hayley – As I mentioned before, I understand how motherhood can become an obsession, taking over everything in your life. Marianne – Like her, I love nice things and sometimes I really have to rein myself in! Jane – Love and respect your parents. If you have parents like hers or mine – cherish them every single day. What do you (dis)like about your characters? Likes: Even in her dire situation she reaches out to help others. Dislikes: This is not a dislike, more an observation that domestic abuse victims are made to feel worthless – that is part and parcel of the abuse. Likes: She is kind and thoughtful. Dislikes: This is not a criticism but she does allow her desire for a child to dominate every part of her life. She is blinded by obsession. Likes: She has an inner strength that she eventually taps into. Dislikes: She cannot see how damaging her relationship is. Love disguises how she is being toyed with. Would you and (one of your) characters be friends ‘in real life’? I would be proud to be friends with each and every one of the ladies. My next project is ‘The Unravelling of Margot Pike ‘. The story centres on a single, twenty-six-year old woman who creates a make – believe world in order to compete with her sister’s exotic life in New Zealand – as well as to escape her own mundane existence. Her lies become more and more outrageous and the unravelling begins.